A corporation decides that profits are more important than people and poisons a community’s water supply. Unethical and immoral police officers abuse their power, target, harass and even kill innocent people. A parent places her trust in a teacher, coach, or doctor, only to learn that trust was used to abuse and harm her child. Who holds these bad actors accountable? Who sends the message that this behavior will not be tolerated in our communities? Who makes sure our schools, workplaces and neighborhoods are safe? That our water is clean? That products meant to help us do not actually cause us harm? That our work is fairly compensated? That only those actually guilty of a crime are punished by the law? The answer is: YOU DO. 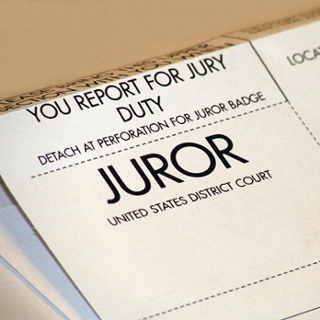 By participating in the most powerful right granted to any citizen of any nation on Earth–The American Jury System. Every day, lawyers go into the courtrooms across the country seeking to right a wrong. Let’s face it, that’s what courts are for. Someone has been hurt in an accident, or from a dangerous product. A crime has been committee. Someone didn’t honor a deal. There’s been an injustice that requires someone to make it right. Before there were juries, crimes and controversies like these were decided by the King. But, imagine a system of government where the King decides he wants a new castle and he takes your home and land to build it. He does not buy your property from you. He TAKES it. He does not give you a new place to live. In that same system of government, the King can accuse you of a crime, then he alone can decide whether you are guilty. In that system, your freedom, your life, and your property depend on whether this one person is just and honest, or corrupt and biased. Think about that. The man who wrote the Declaration of Independence called a trial by jury the ONLY way he could imagine to force a government to play by the rules. But, we risk losing these protections if people treat jury duty as a burden instead of a privilege. Where else can we achieve so many of our democratic values in one go? Participation, deliberation, fairness, equality, accountability, liberty, and the common good are all embedded in jury service. Jurors get involved in some of the most personal, sensational, and important events happening in their community. A jury may be asked to decide whether a person remains free or spends their life in prison; whether a big corporation remains in business, or goes bankrupt; or whether the government can take someone’s property for public use. In addition, jury service helps people to hone their self-governing skills. Jurors act just like elected officials. They are asked to “vote” based on contested facts. They are required to debate issues, listen to others, and consider dissenting opinions. Jurors are required to understand the law, the rights of the parties, and the legal rules guiding their decision. A successful democracy needs citizens with these skills. Deliberation, debate, tolerance, cooperation, civility, legal decision making are the bedrock of self-governance. So, the next time you get a notice for jury service please be excited. You have been invited to participate in the most direct form of democracy on Earth. Treat it that way. If you are questioned by the Court, be open and honest. Remember, if you can keep an open mind, listen to the evidence and follow the law, you are going to be a great juror. Don’t think other people are smarter than you, or more qualified than you. Juries speak for the community, so they need people from all walks and parts of it and each of those people has an equally important voice. Jury service is also the one example we have of true equality in government. 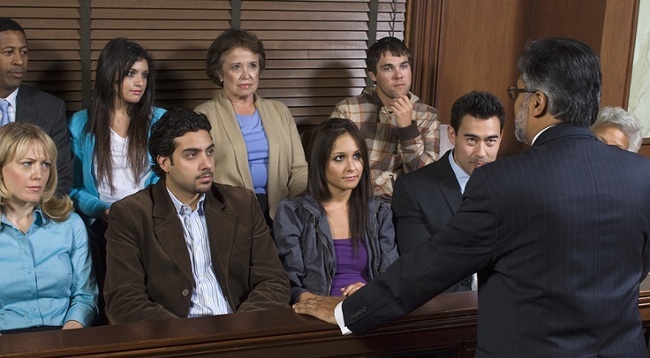 In the jury room, an engineer has the same vote as a teacher, a laborer, a student, or a dish washer. They have all seen the same witnesses, heard the same arguments, and they all get an equal vote in the decision. A true democracy. Finally, even though you will have make some personal sacrifice, you won’t regret serving on a jury. I have never failed to meet a juror after trial who told me “I didn’t want to be on this jury, but I am glad I served. 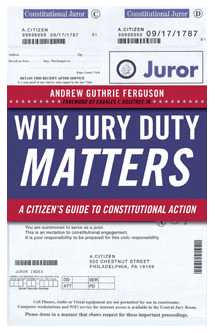 I learned something and felt like I was part of something important.”If you would like to read more about this important issue, I suggest picking up Why Jury Duty Matters: A Citizen’s Guide to Constitutional Action by Andrew Guthrie Ferguson.